1. 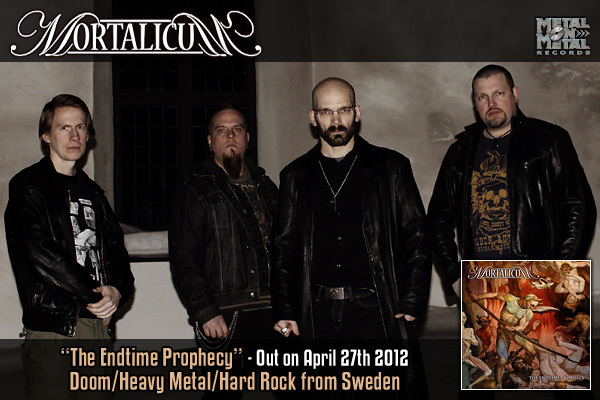 The new album “The Endtime Prophecy” was just released. Tell us a little bit about the whole process (composing, recording, production). - It actually started in 2010 when I had written the first two songs for the second album which were The Endtime Prophecy and My Dying Soul. From there it went really smoothly with Henrik also bringing in great music to the band. In the end we even had songs that we saved for a bonus release (released by the band, not the label). We wanted to keep the album around 45 min. and it’s also great to have something extra to make available for the fans. We began recording in our own studio in April 2011. We first tracked the drums while the rest of us played along for reference. We don’t use click-tracks, we don’t cut and paste, we just record our music the way it sounds. After that we tracked bass, guitars, leads and vocals. No magic really. Then in October I began the mixing and mastering process and in November we handed over the complete album to the label. It was released in April this year (2012). 2. This is the second release through Metal On Metal. How did the collaboration with this Italian independent take place and how is it going so far? - It was back in late 2009 when we had recorded all songs for the Progress of Doom album when I contacted the label. I used the song Into the Night to get their attention and after they heard the whole album we signed the deal. The collaboration is going very well and they are really dedicated to the old-school metal and travel to practically every festival that exists. I must praise their passion for metal! 3. Your sound is not chained to a particular style but you blend several influences, ranging from 80s Traditional Metal to 70s Hard Rock going through some Heavy Doom. Which are your main influences? - Black Sabbath for sure is our biggest influence and inspiration, but also Deep Purple, Thin Lizzy, Rainbow and all those classic bands that made great music back in the 70’s and 80’s. Even though we play quite heavy music the classic rock legacy must not be forgotten since it’s a big part of our sound and style. We like to get the grooves and melodies in our music as well. 4. The lyrics are always an important part of Heavy Metal. Would you like to highlight and explain some of the lyrics on “The Endtime Prophecy”? - Some songs share a conceptual theme about the endtime prophecies and some questions and views on that theme. The songs The Endtime Prophecy, Devil’s Hand, Embracing Our Doom and The End are all linked together lyrically. The other lyrics in general are about life and death and the struggles and questions surrounding that. 5. Playing this type of old school Hard Rock / Metal, which is not trendy or commercial, what are your thoughts on the current Hard ‘N’ Heavy scene? Are there any new bands that you like or you just stay faithful to the old school stuff? - I have to admit I mostly stay faithful to the old stuff. I think some new bands try too hard to sound like something from the 70’s or so. But still, who can blame them? The sound was great back then! - No, there is no tour planned unfortunately. - We are flying to Malta in early November to participate in the Malta Doom Metal festival. It will be great to meet with friends and play at the festival which is getting stronger every year. It’s their fourth edition already! - Thank you Ricardo for this interview! It is much appreciated! The final message is: Support the underground bands and buy their albums! They are the true metal heads who play music for the pure love of it. They hardly ever get the money they’ve spent back, so every dime that finds its way back to the bands is worth gold. And remember... Stay Metal!! !